Here we are, this is the end of Winter and the beginning of Spring, what a good news! The weather is going to be a little more sunny but the cold is staying for a little while and now, you’re going to ask yourselves: « Ugh, what should I wear?« . Here is my answer with six sweaters from CNDirect.com, cheap (SO cheap), cute and totally adjustable for any occasion or temperature! The first one is perfect for place on Earth where Spring means cold days with a nice blue sky. With its thick fabric it will keep you warm during Winter, but paired with tights, knee socks, a legging or even a jegging and a pair of boots, it is totally ok for spring’s early days. If you prefer a brighter color, something more pastel, you also can go for this second sweater. Same fabric but different colors brought here by an « ombre » kind of style. Now, if you’re a really colorful girl, you can opt for the total look by adding a long and vibrant sweater dress over a light bottom. Plus, you’re like a real little sunshine and bring happiness wherever you’re going. But if you live in countries where Spring means the beginning of the hot summery days and you love sweaters, don’t worry, you can wear them too! Cropped sweaters are the best way to wear something a little thick without feeling too warm. Paired it with a hight waisted skirt, skort or short and you’re ready to go! Wanna go lighter? This one-shoulder blue sweater will totally work for a late afternoon out. Plus, jewels are perfect for a day-to-night look and the little flower are a must-have to celebrate spring. Last but not least, if it’s really, really hot, put on yout swim suit or a tank top and this « crochet sweater » will do the trick! 1. 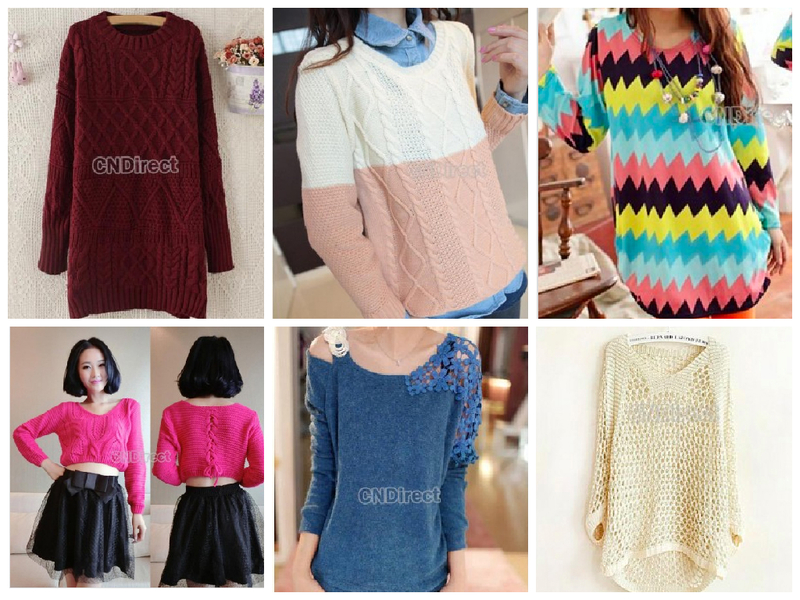 Long Knitted Sweater, 8,31 euros. 2. Ombre Sweater, 4, 81 euros. 3. Colorful Sweater Dress, 4, 26 euros. 4. Cropped Sweater, 6,34 euros. 5. One-shoulder Floral Sweater, 5,79 euros. 6. Crochet Sweater, 5,24 euros. Do you already know CNDirect.com? How do you switch your wardrobe from Winter to Spring? What’s your favorite piece to go from Winter to Spring? Realised in partnership with CNDirect.com. Je te vois tellement bien avec aha! Personnellement, j’ai une préférence pour le tout premier, mais je pense que c’est en partie à cause de la couleur, qui est ma couleur préférée! Effectivement c’est le premier avec lequel je te verrais le mieux aussi ! Je pense que je vais me le prendre le bleu, a ce prix la c’est franchement abordable ! De mon côté, j’ai également pris un ou deux petits trucs, en tout cas, si tu craques, n’hésite pas à passer par les liens de mon article et si tu as une quelconque question, je suis à ta disposition!